Day 1 will have a small Snack Break and then a full Lunch Break where you can bring your own food or walk/bike/drive to food options including the Fresh Market, First Watch, Panera Bread and a few more local favorites on Mills Ave.
Mat Rentals, Beverages and Snack Bars are available at the studio for a nominal fee. Yoga is the Meditative Process - Pranayama a chief method of it. A careful study of the practices of yoga from numerous approaches, which are often called separate traditions, revealed very clearly through one uniting source by the teachings of Maharishi Patanjali, explains that yoga can only be considered yoga when the effort and focus is on the inner space, the internal. Pranayama has been recommended as a key technique to touch the inner space, if done correctly, also affirmed by Patanjali in the sutras. Additionally, completely honest and open self-reflection, self-awareness, and the willingness to catch our behavior and change it, is essential to what yoga is. Pranayama, with asanas and kriyas, can cultivate such a process but equally the practitioner must be willing to engage, to look in, and to make any necessary change, which usually culminates in letting go, undoing, less rather than more. It is not more practice that is needed but well understood and insightful practice. At first all the practitioner sees are the elements of each practice. It takes time for them to all come together. And with that dedication, willingness, and love. In time the technical separate qualities of one technique, be it asana or pranayama, become richly embedded in a meditative process ‘soupy-mix’. How delicious. But who is willing to continue the practice, and not just continue the doing but the reflection and undoing over time? It is hoped that some of this can be shared through pranayama methods and asana approach (all practice) in our morning session and a healthy discussion with questions about all this in the afternoon session (Talk & Q+A). Paul is a long term devoted, yet easygoing, practitioner of yoga. He is reputed as a well-known world-class yogi, scientist and teacher with 30 years of experience in the practice and study of yoga, the breath, and the meditative techniques while being a happy father to two sons. He has witnessed his own growth through many techniques and years of practice, watching how the practices evolve over time as the student develops over time. His dedication to the path of yoga has come from a combination of intense practices, meditative experiences, silent retreats and numerous pilgrimages in India, Tibet and Thailand. He has had the good fortune to spend many rich years with his main teacher in pranayama and the meditative process, Sri O.P. 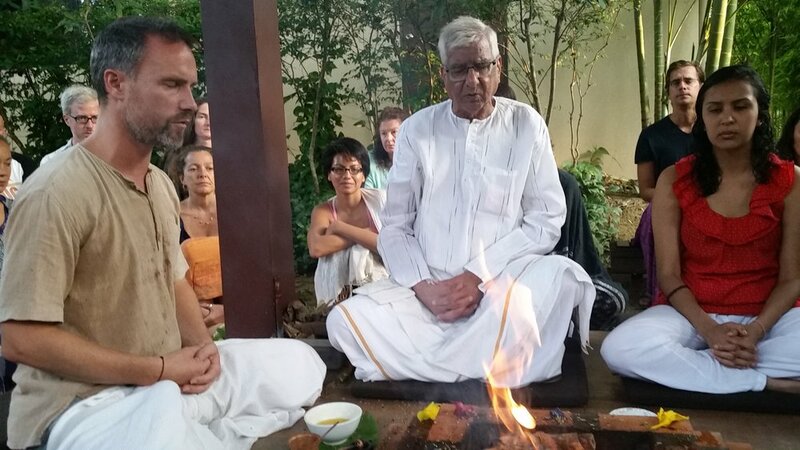 Tiwari, now placed to carry forth these teachings and the tradition of Kuvalayananda. Paul was one of the dedicated few to put in many joyful years living in Mysore with Pattabhi Jois in the old days of ashtanga vinyasa, certified by him, with an expertise in asana. Living in Thailand for many years, Paul has also been involved in Buddhist culture and practices, many retreats in forest monasteries which are curiously appropriate for all these yogic practices. He is highly interested in the inner journey of yoga and continues to study, not just the practices and their traditional textual statements, but also what modern science offers this. Paul was accepted into one of the top PhD programs in the U.S., at Emory University, Atlanta, to conduct scientific research on yoga and its effects. In this sense his interest lies in achieving balance, which Paul terms as “centered", and where his focus in academic scientific research hopes to contribute to what is the beautiful ongoing legacy of yoga and its practices: the internal life, the inner space, pure joy, sukha, centered. Paul has led workshops and trainings all over the world, and founded the retreat center, Samahita, in Thailand, that teaches students from all backgrounds and all levels in Centered Yoga as an open-minded method to encourage inner awareness. He believes in the mission of spreading health and wellbeing through engaged participation in practices and that the fields of yoga and meditation are one, not separate techniques, commonly united on the internal path of both an open heart and sincere self-examination. Music, lightness, fun, dance, sharing and caring, and a sustainable approach to this world, are all integral to this process. Such focus and openness is all part of Centered Yoga. Conveniently Located in Downtown Orlando, just near I4 (Take Princeton or Amelia Exit and follow local roads) and just off of Mills Avenue.